One of the things I’ve struggled with the most since I started trying to cook without plastic has been trying to find cheese without plastic. For soft cheeses, it hasn’t been a problem. I’ve figured out how to make ricotta cheese and cottage cheese with minimal plastic. But for hard cheeses, it’s different. Unfortunately, most places sell their cheese wrapped in plastic wrap. Plastic wrap is bad for several reasons, but the biggest reason is that some plastic wrap is made of polyvinyl chloride (PVC). PVC is toxic (it contains phthalates) and has a zero percent recycling rate. I got that statistic from Bag It, which is a movie that I highly recommend watching if you haven’t seen it. So what are you to do when it comes to buying cheese plastic free? Here’s what I’ve discovered. 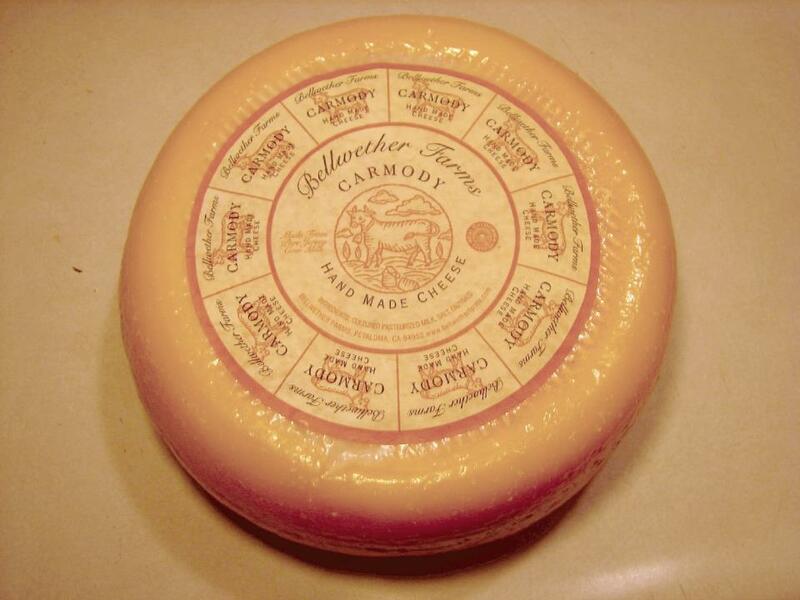 This cheese is Bellwether Farms Carmody. It’s really good. I made goldfish and macaroni and cheese with it. Both recipes turned out really well. In the future, I’ll be buying other cheese varieties that come in whole wheels. To store this cheese once I cut it open, I wrapped it tightly in parchment paper and put some rubber bands around it. (Its important to wrap cheese tightly to prevent it from drying out.) There are also these instructions on how to store cheese without plastic from Beth Terry of My Plastic-free Life. You can also wrap cheese in Abeego flats, a plastic-free alternative to plastic wrap. Another option is to shred and freeze a bunch of the cheese in glass containers right when you buy it. This works well for me because most of the recipes I use that call for cheese call for shredded cheese. I have found that if you take your own containers to the cheese station, the person there will cut your cheese and place it in the container. I do this with my glass jars at whole foods. You can also go to the deli section of a grocery store and have them chop you chunks and place it into containers. I hope this helps. I’ve done this before, but usually the bricks that they cut the smaller pieces from are wrapped in plastic. It’s definitely a better option than buying individual plastic-wrapped pieces though. Cheese usually freezes really well. That ‘s what I do when I buy a whole wheel. I never knew that. My freezer is pretty tiny but I’ll try that next time I buy a whole wheel. Thanks for the tip! I’m confused…don’t those wheels of cheese come wrapped in plastic themselves? No, wheels of cheese are covered in a thick rind. The rind protects the cheese inside from going bad or drying out. The problem is that once the wheel is cut, it needs to be wrapped in something to protect the cut side and usually that’s plastic wrap. But whole wheels are usually sold either packaging free or wrapped in paper. What is the rind made of? It usually looks and feels like some form of plastic. Thanks. Ok, I guess the rind is the part that forms naturally as the cheese ages. But isn’t there usually an additional layer of either wax or plastic added later? The wax coating on a lot of cheeses is paraffin (derived from petroleum). But this particular cheese has a dry natural rind. Yeah, it does. I updated the post to clarify that. Thanks for pointing that out. I thought I had already addressed that in this post.